Image caption Chapman pleaded guilty to second degree murder after shooting John Lennon four times in the back. John Lennon's killer faces his seventh parole hearing later this week. 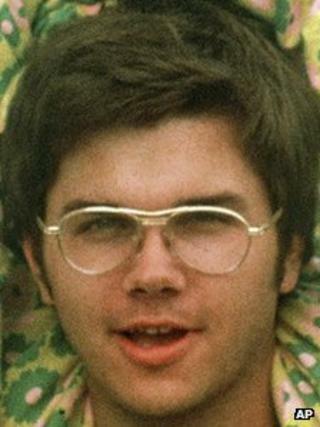 Mark David Chapman, now 57, was jailed for 20 years to life after he confessed to shooting the Beatles singer outside his New York apartment in 1980. He has come up for parole every two years since 2000 and has been turned down each time. In 2010, officials said his release remained "inappropriate". A decision on whether to release him will likely be made public by the end of the week, a prison spokeswoman said. Chapman's interviews with the parole board will take place at Wende Correctional Facility, a maximum-security prison in Alden, New York, where he is currently held. He was transferred to the facility in May this year, where he was understood to have been placed in protective custody, though the reason was never made public. In the past, Lennon's wife Yoko Ono is among those who have urged New York state officials to keep him behind bars, saying she fears for her own life and that of his two sons. The former security guard, who has a history of mental illness, claims to have undergone a religious conversion while in prison. On his last attempt at release - in September 2010 - Chapman is understood to have told the parole board he believed that "by killing John Lennon I would become somebody". Denying parole at the time, the board cited his "disregard" for human life, adding: "This premeditated, senseless and selfish act of tragic consequence... leads to the conclusion that your discretionary release remains inappropriate at this time and incompatible with the welfare of the community."